Confused about SSC CGL post preference? Staff Selection Commission (SSC) gives the applicants an opportunity to choose preference of posts in Combined Graduate Level (CGL) recruitment application. It was a time when SSC has to give post allocation to all successful candidates. But now the time has been changed. Applicants can now choose their own posts that they prefer and based on their preferences, they are alloted to a post. Although post allocation is solely made on the basis of merit list (marks obtained in entire exam). But before that, it is required to give preference of posts in CGL application. Many applicants become confused about the post preference. They didn't know in which order the post preference should be given. Based on our analysis we have given here an order of SSC CGL post preference. Hope it will be very useful to all applicants! 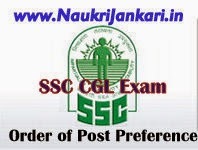 What should be the order of SSC CGL Post Preference? Well, there are total 30 posts in SSC CGL application form. The pay scales, nature of jobs are different. Grade Pay (G.P.) of some posts are Rs. 4600, some are Rs. 4200, Rs. 2800 and Rs. 2400. So considering all these things, we have arranged an order of preference of posts for SSC CGL recruitment exam. First select the posts whose GP are Rs. 4600, then Rs. 4200 and so on. So, here all 30 (13+7+5+5) posts have been mentioned. Disclaimer : These preference order is fully made based on our own analysis. Now it's your sole right to choose accordingly. 0 comments for " Order of Post Preference in SSC CGL Application "